Originally published under the title "The Politics of Lies." Turkish President Erdogan's chief advisor, Yigit Bulut (left), says he's willing to die for his boss. Rizuan Abd Hamid, a local leader in Malaysia's ruling party, says he's willing to fight for his prime minister "until his last breath." A flight from Kuala Lumpur to Istanbul will usually take around 11 hours. All the same, politically, Turkey and Malaysia are not so distant. 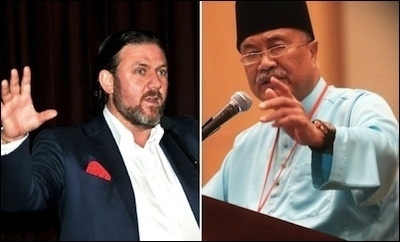 The Turkish-Malaysian political parallels are crucial in understanding political Islam. Back in 2013, President (then Prime Minister) Recep Tayyip Erdogan's chief advisor, Yigit Bulut, said that he would be "willing to die for Erdogan." He added: "There are millions like me." The statement was not shocking news in a country where Erdogan fans had the habit of walking around in shrouds -- in expression of their willingness to die for the supreme leader. Two years later, the same leader fetish has emerged in Malaysia. Rizuan Abd Hamid, a local leader in Kuala Lumpur of Malaysia's ruling party, UMNO (United Malays National Organization), said that he was willing to fight for Prime Minister Najib Razak "until his last breath." In 2013, Erdogan's government was badly shaken by two events. In the summer, millions of secular Turks took to the streets to protest the government's increasingly authoritarian and Islamist practices. In December, countless audio leaks, police reports and indictments unveiled massive corruption involving Erdogan, his family, four government ministers, high-ranking bureaucrats and Erdogan's business cronies. The essential dynamics of the Islamist polity do not much vary from one Muslim-majority country to another. Two years later, thousands of Malays are protesting Najib under a campaign named Bersih ("clean") -- a loose coalition of non-governmental organizations that demand electoral reform. In July, the Wall Street Journal reported that nearly $700 million had been deposited into Najib's bank accounts shortly before elections in 2013. The money is linked to a government-owned investment company, 1MDB, whose dealings are now being probed in Switzerland. In 2013, Turkey's pro-government media and AKP party loyalists falsely claimed that the corruption allegations against Erdogan were being masterminded by the Jewish lobby (among other foreign groups). In Malaysia, one party leader said that the money found in Najib's account would be used in a political campaign against an opposition party, which he falsely claimed was backed by "clandestine Jews." In Malaysia, a government agency suspended the printing licenses of two newspapers, and now the government is considering curbs on social media. "There is no more rule of law," said Mahathir Mohamad, who was Malaysia's prime minister for 22 years. In Turkey, hundreds of journalists critical of Erdogan have been intimidated, prosecuted or have lost their jobs. Most recently, state prosecutors launched a probe into the country's most influential newspaper, Hurriyet, allegedly for making terrorist propaganda. UMNO has led coalition governments in Malaysia for six decades. It remains the most popular political party among ethnic Malay Muslims. Erdogan's Justice and Development Party (AKP) has been Turkey's most popular party since it joined the political race in 2002. Its voters are mostly conservative Muslims. In a 2013 speech at a United Nations forum, Erdogan said that Zionism is a "crime against humanity" and likened it to anti-Semitism, fascism, and Islamophobia. In the same year, Erdogan, along with Iran's supreme leader, Ayatollah Khamenei and UN official Richard Falk, was on top of the Simon Wiesenthal Center's annual list of the top 10 anti-Semitic and anti-Israel slurs. The Malay response to Erdogan came with some delays. Last month UMNO party bigwig Rizuan Abd Hamid expressed pride in that "UMNO is one of the few governments that fight the Jews... other Asian countries have already been defeated by the Jews; Singapore is done, Thailand is done, Philippines is done, Indonesia is almost done for, but Malaysia has been protected by Datuk Seri Najib [Prime Minister Razak]." Hardly any of this is surprising. The essential dynamics of the Islamist polity do not much vary from one Muslim-majority country to another, despite deep cultural, ethnic and linguistic differences: Corrupt, authoritarian leaders who have no respect for ethnic or religious plurality or dissent of any kind, who crack down on the press and legitimize their corrupt governance by frightening Muslims masses with a made-up threat of the clandestine Jew. Few Turks could point to Malaysia on a map of the world. But most would sympathize with their "Malay brothers." It must be a pure coincidence that Turkish Prime Minister Ahmet Davutoglu's official curriculum vitae proudly mentions: "In 1990 he became an Assistant Professor at the International Islamic University of Malaysia where he established and chaired the Political Science Department until 1993."